Description: This is an electronic copy (pdf) of the Voicing Modes book (the latest version, 3rd edition). You'll get an instant email with download link. Full color! Voicing Modes is a book for all guitar players who want to master their modal comprehension and ability. Focuses on a chord-voicing approach to hearing and practicing modes. For comping, improvisation, reharmonization & composition. With detailed explanations, reference material, tune examples, and 12 modal etudes. 181 pages. YouTube links for performance examples available. For a free sample, download link available on this page. Mix up your practice session. Compose or arrange with this set. 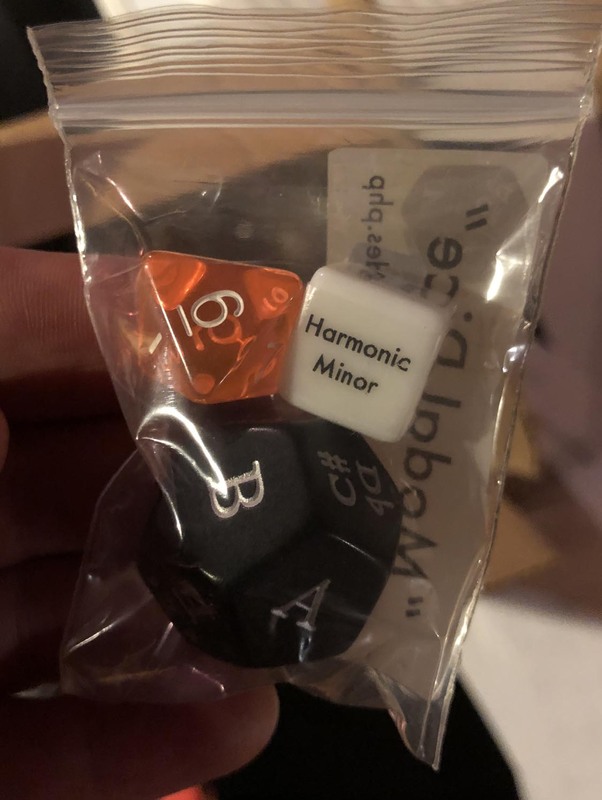 The 6-sided die has the parent scale options (Major scale, Harmonic minor, Melodic minor, Harmonic major, and Hungarian minor, as well as 'synthetic/symmetrical' option), the 8-sided die indicated the mode (8 would usually mean "roll again"), and the 12-sided die indicates the pitch. For example if you roll "3/Melodic Minor/Bb" that would indicate "Bb Lydian-Augmented" (3rd mode of Melodic Minor starting on Bb). Check out the Voicing Modes Web App for for some possibilities! The latest edition. (3rd edition) Voicing Modes is a book for all guitar players who want to master their modal comprehension and ability. 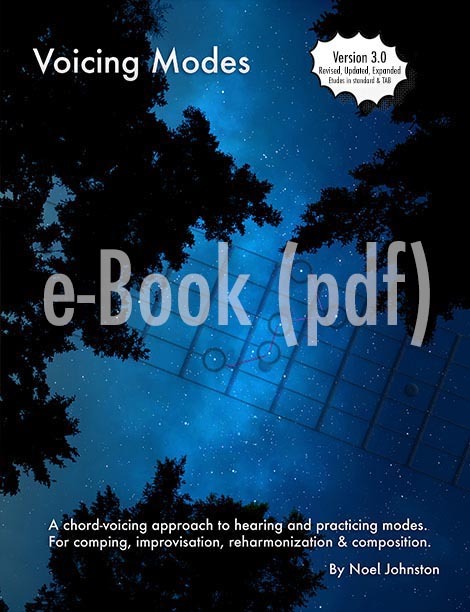 Focuses on a chord-voicing approach to hearing and practicing modes. For comping, improvisation, reharmonization & composition. With detailed explanations, reference material, tune examples, and 12 modal etudes. 181 pages. YouTube links for performance examples available. For a free sample of the book, download link available on this page. Description: Upgrade to Sprial binding. This makes reading on a music stand much easier! 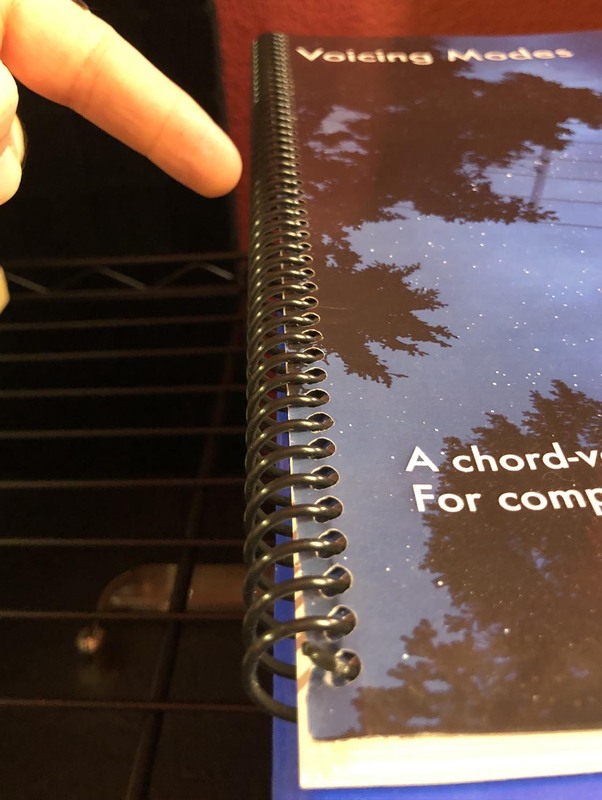 Voicing Modes book (3rd edition) but with Spiral or Comb binding option. To get the most out of this book, you'll want to learn the etudes, the arpeggio, scale and chord shapes and that means putting it on a music stand. It's easier with spiral or comb binding. (spiral binding pictured) For a free sample of the book, download link available on this page.